Ed Chavez from Vertical Inc. In a fictionalized World War II era world, Earth is being attacked by a mysterious alien race known as the Neuroi. 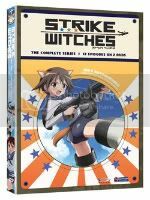 When traditional military forces come up short in combating the threat, the world turns to the girls of the 501th Joint Fighter Wing, the Strike Witches, as their last hope for humanity. The Witches are an ensemble team of young women from around the world with magical abilities, which periodically manifests itself in the form of animal ears and tails. By attaching the special machinery known as Striker Units to their legs, the girls’ magical powers are enhanced and they also gain the ability to fly. With the Striker Units in place, the girls take to the sky to do battle with the Neuroi in high altitudes. 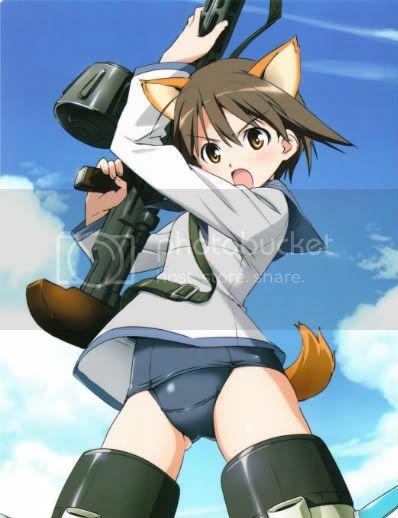 The first season of the Strike Witches TV series centers around Japanese school girl Yoshika Miyafuji. Because of her magical healing ability, she is recruited by Mio Sakamoto to join the girls of the 501st. The pacifist Miyafuji is reluctant to become a fighter in the war, but when she discovers that her missing father is the inventor of the Striker Units, she goes along with Sakamoto in search of him. It is no secret that I love Strike Witches. For the past few months, I have been heavily promoting the series on my twitter and blog as FUNimation has been embarking in their tongue-in-cheek “War on Pants” campaign. 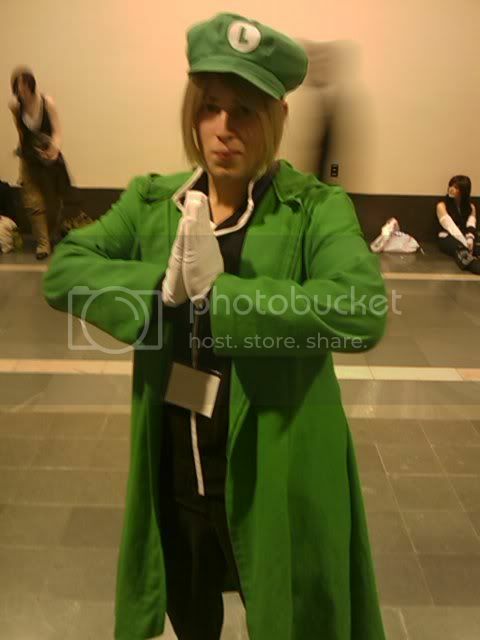 But my love for the show has been there since it first debuted in Japan nearly two years ago. I named it my #1 anime release of 2008 because it was the first commercially successful anime to be legally available online for a global audience. However, there is a reason why this became such a big seller in Japan. In a market that has been overflowing with moé titles for years, Strike Witches manages to take the science of fan pandering and make a goddamn masterpiece out of it. They are cute girls who walk around with no pants on. … and oh yeah, they have animal ears and fluffy tails when they go flying. Some of them are even cat girls! Do I really need to say any more about it? Final Verdict: Strike Witches is the best show ever made. Review copy provided by FUNimation Entertainment. In order to relieve her recently divorced mother of tuition cost, the young Souka decides to transfer from a private high school to the local vocational school. However, when she shows up to her first day of classes, she is shocked to find out that she is the only girl enrolled there! There’s a reason why all the girls had dropped out of this tech school. The boys are very tough and fights often break out between the different classes. But amid all this chaos, there is one unwritten law that all the boys abide by, and that is the role of the bancho, or gang leader. Simply put, there is one bancho who rules over the entire student body, and in order to dethrone the leader and take his place at the top of this pecking order, you must knock the crap out of him in a fight. Needless to say, the poor innocent Souka wants nothing to do with the feuding between the classes or power struggle of the bancho. However, because she is the only girl in school, all of the boys go out of their way to make her feel warm and welcomed. So she decides to stick around the school and eventually becomes friends with the cool Katou-kun. But one day, she accidentally knocks out the school’s current bancho, which means that she takes over as the new gang leader. Can the sweet girl actually rule over this student body of thugs and riffraffs? 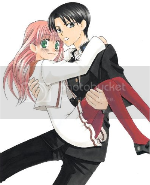 My Darling, Miss Bancho is the first (and so far only) comic by shojo artist Mayu Fujikata. While her inexperience is evident on every page of this volume, it ultimately ends up being her greatest strength as CMX Manga releases another winner in this shojo title. 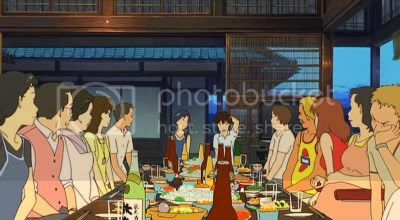 So after a huge mix-up regarding my coverage of the NYICFF this year, I was finally able to catch a screening of the highly anticipated new film from Mamoru Hosoda, Summer Wars, last weekend. Well, pretty much everyone and their mother has seen the film and have written a review of it, and for the most part, the film has been unanimously praised by everyone. However, I wasn’t quite as wooed over by the film as everyone else was, and when I tweeted this out, I got some peeps asking me to do a review on it. Well, I wasn’t really planning on doing this, so here’s my brief review of Summer Wars using as little spoilers as possible. Summer Wars is a good movie, it might even be a great movie. But is it as amazing as the hype makes it out to be?